As featured on The Marketing Society in Scotland’s ‘What’s Going On’ members update. 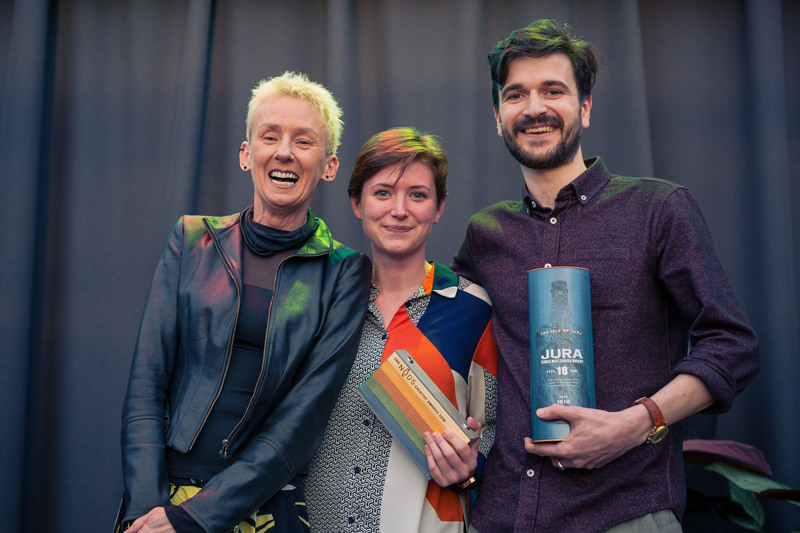 Just over a month ago at the Star Awards, StudioLR took home Gold in the Design category for their work at Inverewe with the National Trust for Scotland. Inverewe’s personality is unique. 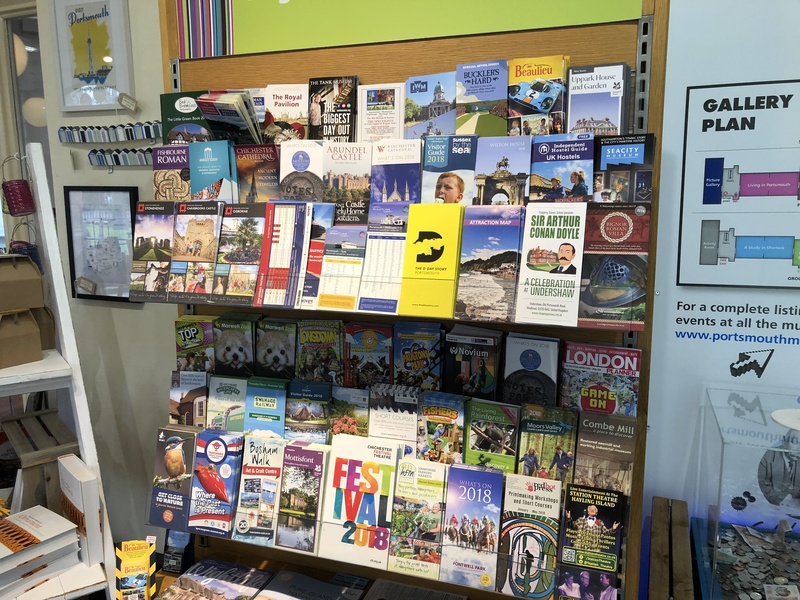 And as it’s been brought to life over the last two years, it has reaped rewards – family visits are up 28% and overall footfall is up 110%. 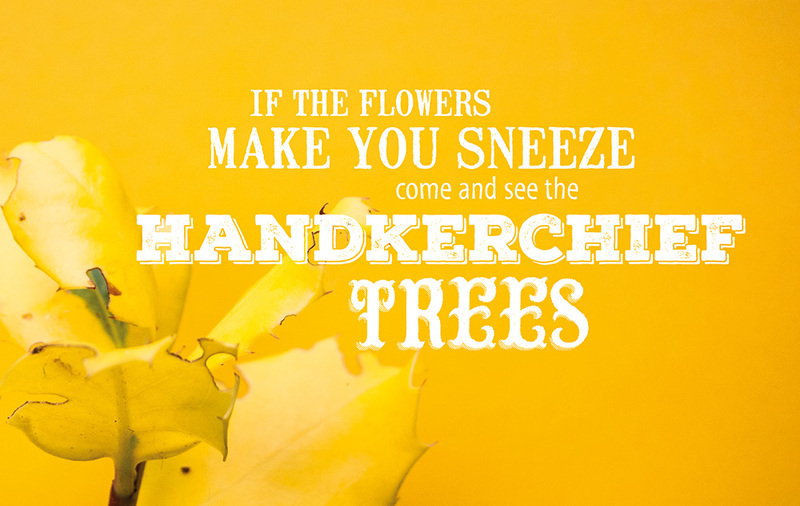 Taking obscure plant names and turning them into Roald Dahl-inspired phrases and rhymes will make some botanists anxious. Printing a family’s favourite recipe on their historic kitchen ceiling will make some conservationists anxious. But this kind of approach gets families excited by plants and history. It’s not easy but it works. When you’re breaking rules, or doing something new, it’s important that people internally see why. Otherwise they’ll feel anxious and see no value. Bringing the conservationists, historians, gardeners, and volunteers in on the creative process meant our ideas were much richer, more unique, and easier to make happen. Kevin Frediani, the property manager at Inverewe has taken the seed of an idea and made it flourish. From ongoing marketing to events programming… even setting up an artists-in-residence programme – the idea has flowed through everything. Getting a wide NTS team involved in the creative stage helped build pride and ownership – we were one team. Ideas are poor value if they just belong to agencies… good ideas are for everyone to use. StudioLR won the Gold award for Design at the 2018 Marketing Society Star Awards. Read more about the Star Awards here. Can you stay true to your heritage and attract a wider audience at the same time? With a site personality bursting with colour and rich stories, the Playful Garden at Brodie Castle welcomes visitors of all ages. 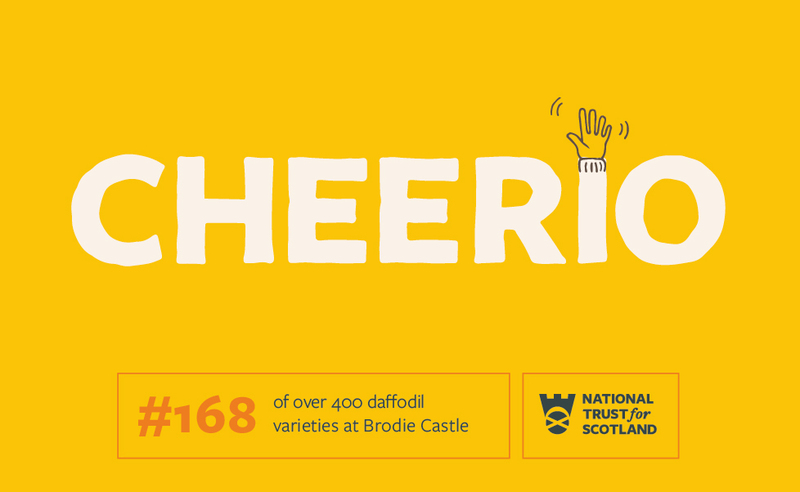 Ian Brodie developed and registered over 400 varieties of daffodil at the Castle – and he named each and every one. The weird and wonderful names were a springboard for stories that sprout up all around the site – from the origami boat tickets (Sailor #160) to merchandise, decor, interpretation and signage. Staying true to your heritage doesn’t mean doing things the way they’ve always been done. We can help unearth what makes you different – and bring it to life creatively in campaigns and experiences that spark something in people. 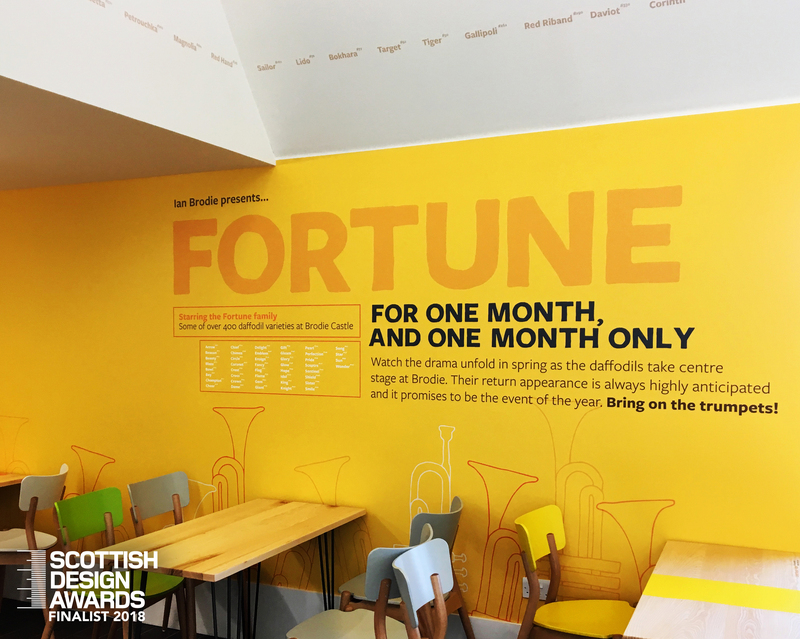 The project is currently nominated at the Scottish Design Awards, along with five of our other projects. The tickets are fun for kids and big kids alike… the daffodil “Fortune’s Arrow” becomes a paper aeroplane, while “Sailor” becomes an origami boat. The daffodil names lent themselves to a huge range of merchandise. “Fortune’s Gift” was a gift for the swing tags. And the most tourist-friendly daffodil names made a great set of magnets and keyrings. Playful signs around the garden remind people to have a good time. Giant plant-marking lollipop sticks stick out in the garden – each one housing an interpretive panel, using the daffodils to tell a unique story. Contact us at StudioLR to find out how brave design-thinking can help you reach more people. 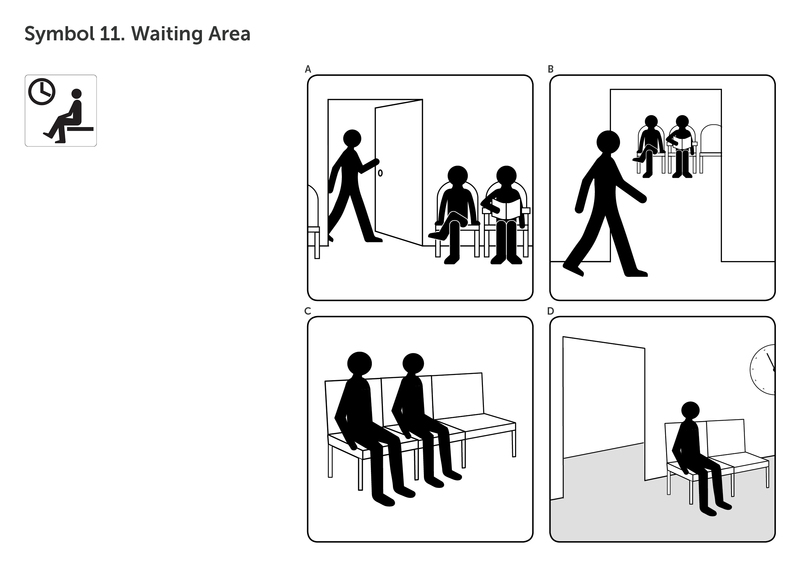 At StudioLR, We’ve been designing wayfinding signage to help people living with dementia live more independently. With features such as dementia-friendly signs, handrails and benches, Kings Park in Stirling recently launched as Scotland’s first dementia-friendly park. 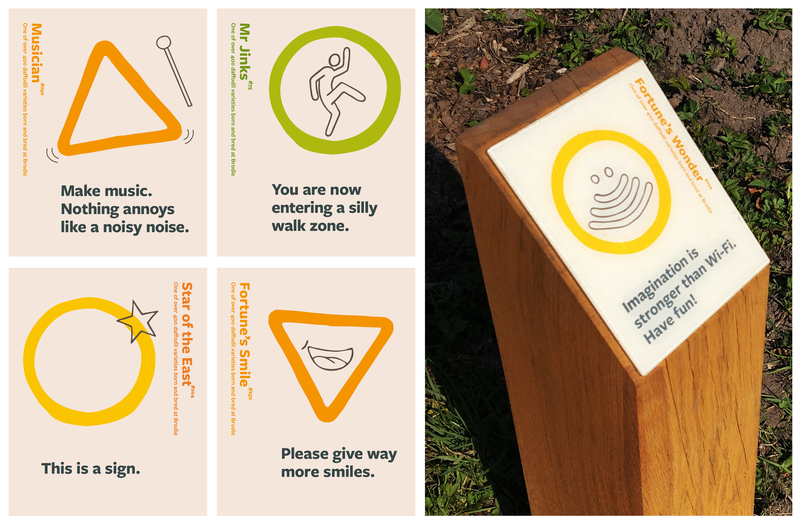 Led by National walking charity, Paths for All, we were asked to design signs which would help people living with dementia navigate the park more easily on their own. 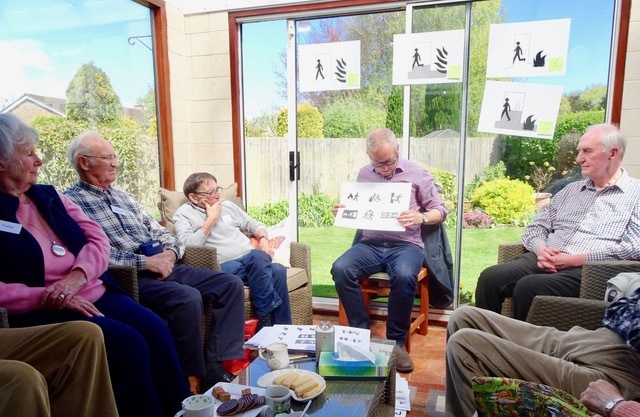 Paths for All came to us after hearing about our successful initiative to design signs that will help people with dementia find their way around care homes. Aligning with our company belief that great design improves people’s everyday lives, we wanted to make a difference to people living with dementia through empowering signage design. 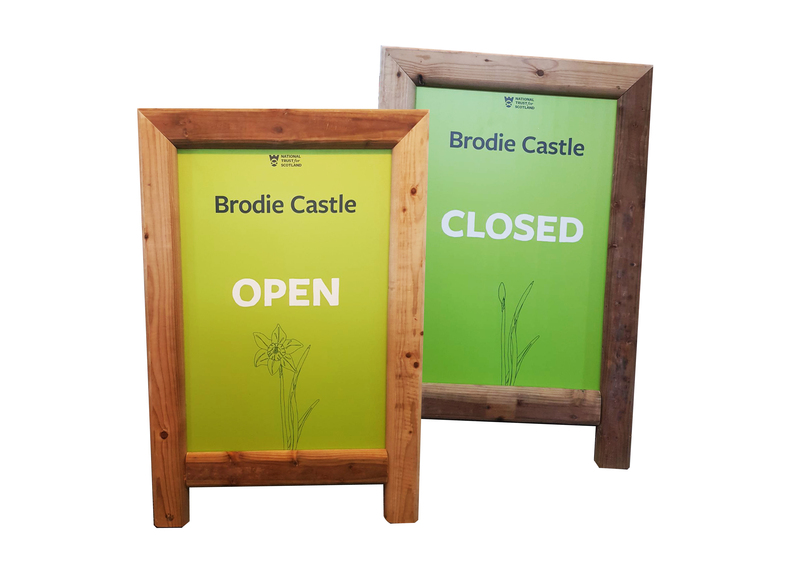 Working with our academic partners (Edinburgh University and Stirling University) we challenged the signage typically used in care environments. Using an academic approach gave us confidence that our assessment was accurate. And our recommendations would have the intended level of positive impact. Easy wayfinding would improve the wellbeing of people with dementia (potentially extending their life) and also reduce the strain and cost on their families and on societal care resources. We realised our findings could easily be transferred to other public spaces, like Kings Park, providing an even greater opportunity for extended independent living. Read more about the dementia-friendly Kings Park project in the Scotsman article here. To find out more about what we’re doing at StudioLR to make the world an easier place to find your way around then read about our latest Inclusive Symbols project. At the Nods Awards, we’d just won the Grand Prix when Dave’s name popped on screen. The lucky blighter had also won the raffle: two tickets to TEDx. A day of inspiring talks and demo labs in Glasgow. So last Friday we set off together on a sun-filled early train, full of anticipation. At the door of the Armadillo we were met with huge smiles and welcoming waves; handed our ‘Ideas Worth Doing’ notepads; and entertained by a jazz trio playing Stevie Wonder. This was a good start. Not like any other conference (or even ‘unconference’) we’d been to before. We jostled amongst the 2,000 attendees for a free seat in the main auditorium, ears and eyes open and ready for 9 hours of stimulation. First up on stage was Van Ives – not a speaker, a band. Two guys playing an engrossing fusion of electronica, R&B and folk. It felt like we were in the TED trance, under the spell already at 9am. The rest of the day developed into an intensive blur (is that possible?) of inspiration, agitation, thought provocation, humour and arrest. From astrophysics to gluten free baking, robotics to tax avoidance, the perils of fame to the power of hope. 1. Expertise is nothing without the input of non-experts. Andy Haldane, Chief Economist at the Bank of England, recalled sharing the good news with the world that the UK’s economy was growing again. The people hadn’t noticed. It turned out the only upturn in the entire UK was in London and the South East. If the economy is to benefit the public, a percentage on a spreadsheet isn’t a good enough measure of success. He was talking about ‘harnessing people’s lived experiences’ and we couldn’t help noticing he was sounding more like a good designer than an economist. A great approach! 2. Base change on truth. Brutal, honest truth. Jean MacAskill Kerr, Leadership and Team Intelligence Consultant at Cisco, talked about how often we change the wrong things because we haven’t dug deep enough and had the awkward, honest conversations. It’s hard to open up and be brutally honest (especially at work) but if you base change on truth you can’t go wrong. 3. Heartstorming not brainstorming. Lifelines not deadlines. Miha Pogacnik, violinist, leadership speaker and huge ball of energy, put a great spin on the idea of ‘business supporting the arts’. He argued that the arts are now supporting business more. Businesses are getting into the emotion of communication, the purpose that drives their passion – the arts have been doing that for centuries. You can’t give less than 100% when you’re playing Beethoven. It was a fantastic day, topped off with the news that Edinburgh has secured next year’s TEDGlobal event. See you there. 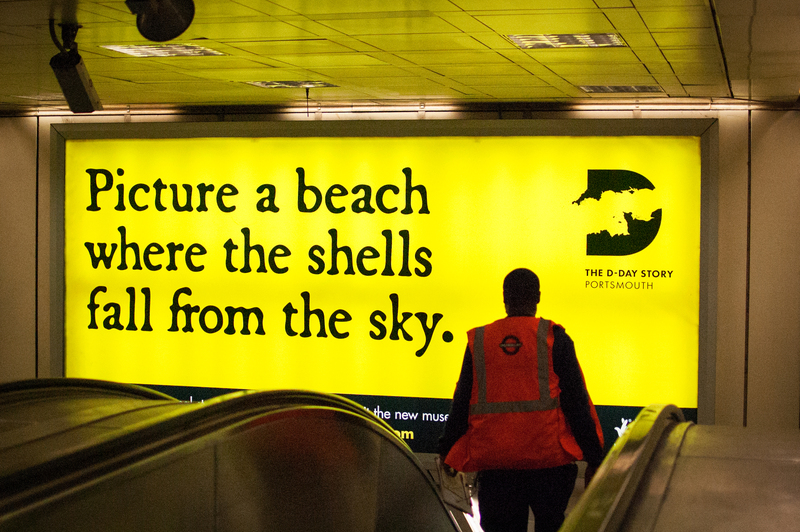 You might have seen our brand identity and advertising campaign for the new D-Day Story popping up across Portsmouth, on the London Underground, on Twitter, and in Design Week. Located in Portsmouth, the museum tells the story of the Allied forces’ invasion of Normandy on 6 June 1944 during the Second World War, which led to the liberation of large parts of Europe from Nazi control – and ultimately Allied victory. 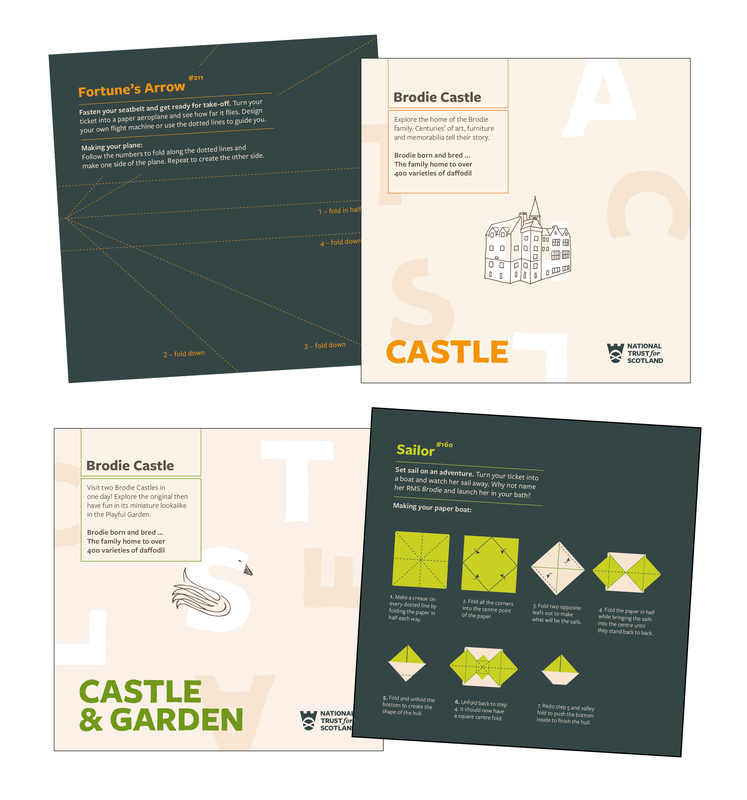 We worked with Portsmouth City Council to give the museum a new destination brand and marketing aimed at moving expectations away from a strictly ‘military’ brand, to one which appeals to all generations. Our Associate, brand strategist Scott Sherrard spoke with everyone from veterans to volunteers, and councillors to students, to find out what the D-Day Story meant to them. The resulting brand is built on juxtaposition: The epic made personal, the personal made epic. 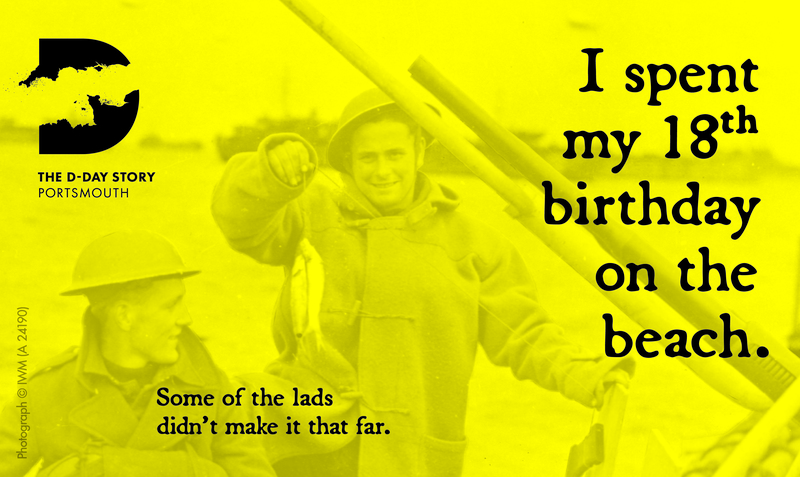 The D-Day operation was so huge that no one person could ever comprehend every facet of it – but we sought to make it personal. 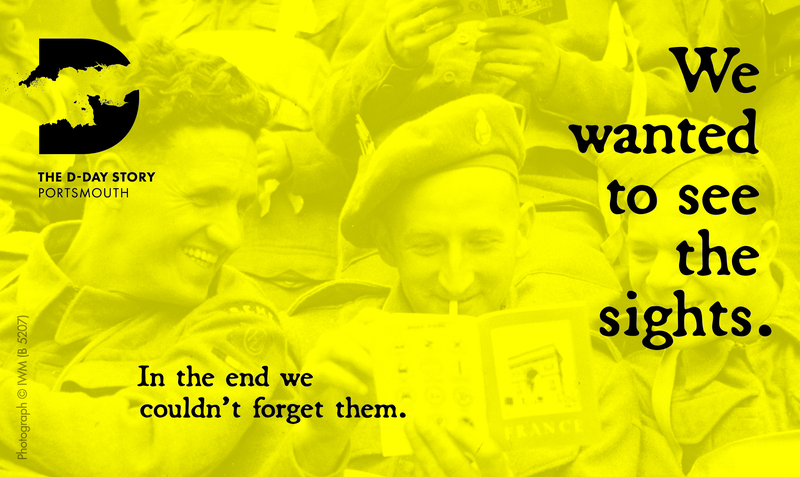 There’s an intimacy to the impact that D-Day had on so many individuals – we sought to shine a light on that and make it epic. 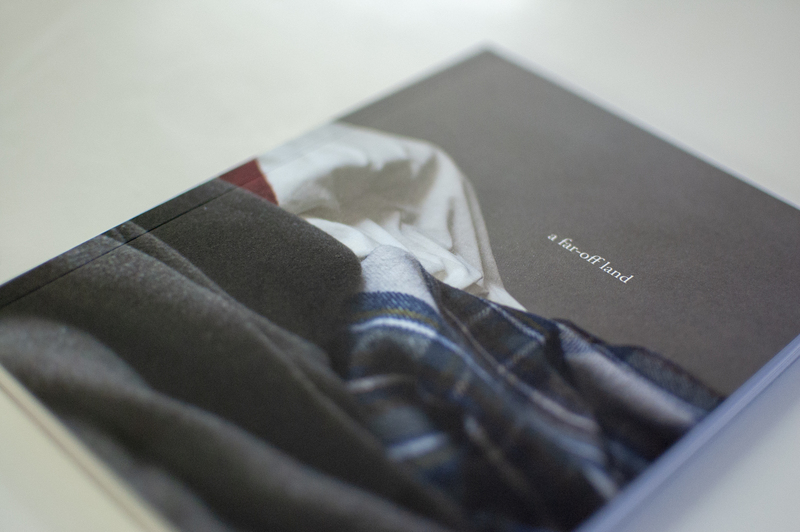 The brand uses archived photography and diary entries to get a real perspective. Marketing and advertising designed to stand out from the crowd. 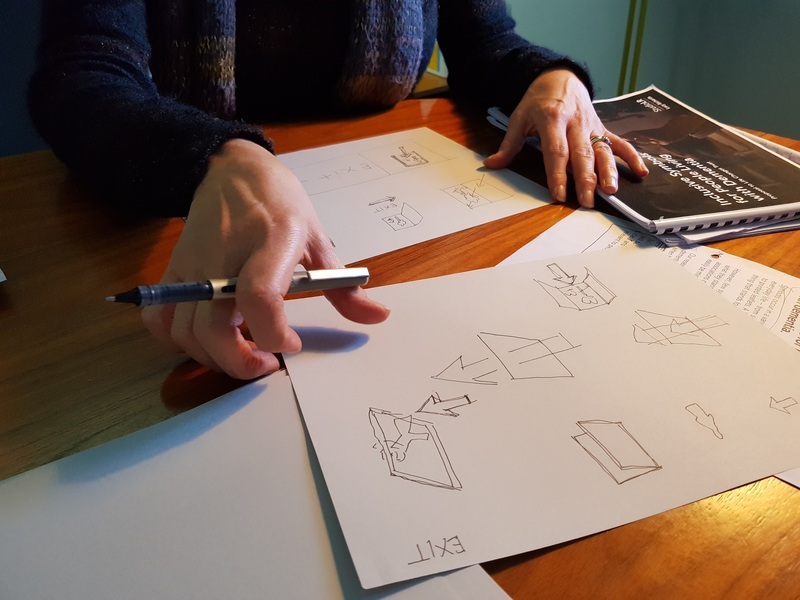 Following on from the concept workshops, we’ve been busy developing the design for each symbol including a number of options which were tested with groups of people living with dementia. Getting into the design we quickly realised there were many different route to explore. 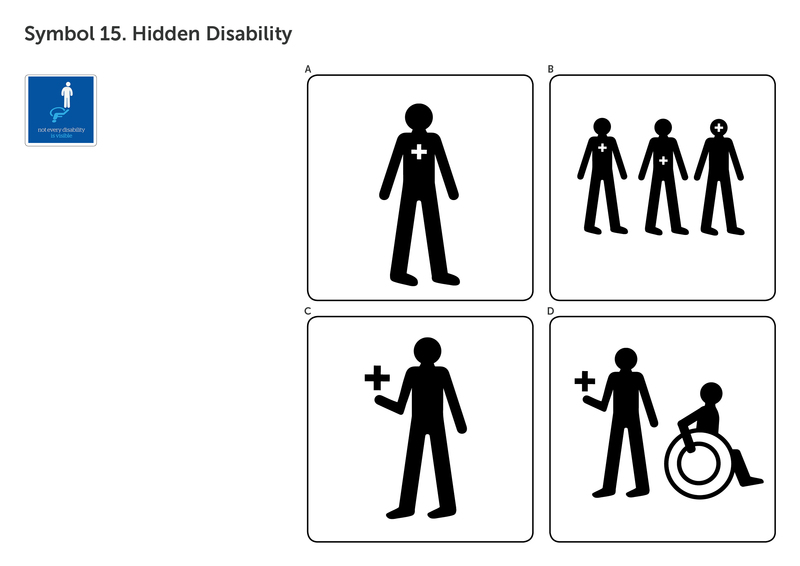 After a series of iterations, we developed four options for each symbol to test various factors that could make the symbols more easily understood by people with dementia i.e. showing perspective, including people/figures ‘doing’ the action, shaded flooring. We considered the styling of the ‘symbol people’ – if they should be ‘morph like’, if they should have necks, or if they should be more human in feature, showing details like clothing and hair. We varied their level of movement, the number of people interacting with each environment, and their activity in each context. 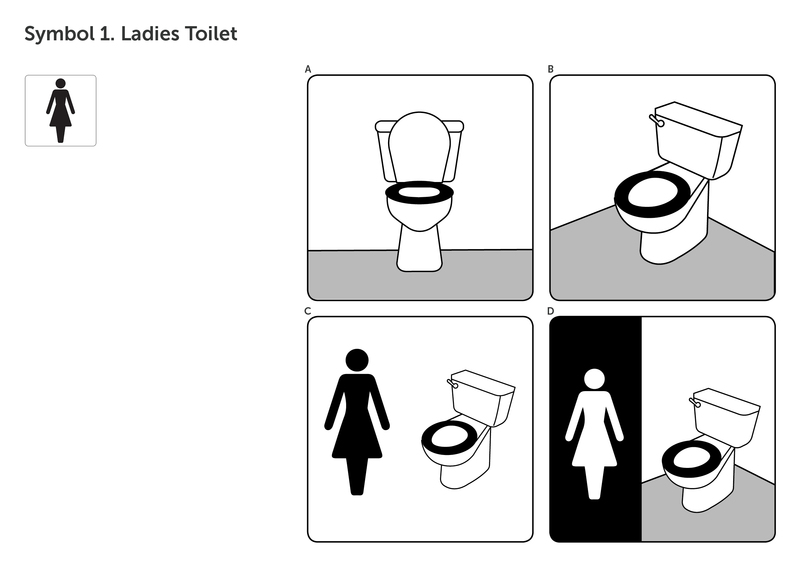 Environments were explored in perspective as well as elevation/straight on, and shading on floors and on objects like toilet seats were visualised to gauge people’s understanding. And we changed the scale on some symbols to see how much information is needed, on close up items like a hand on a door as well as entire rooms and the whole shape of an escalator. The testing stimulus was prepared as A3 sheets with four options for each symbol alongside the relevant current symbol, and a ‘wash up sheet’ of alternative existing options to help stimulate the discussion. 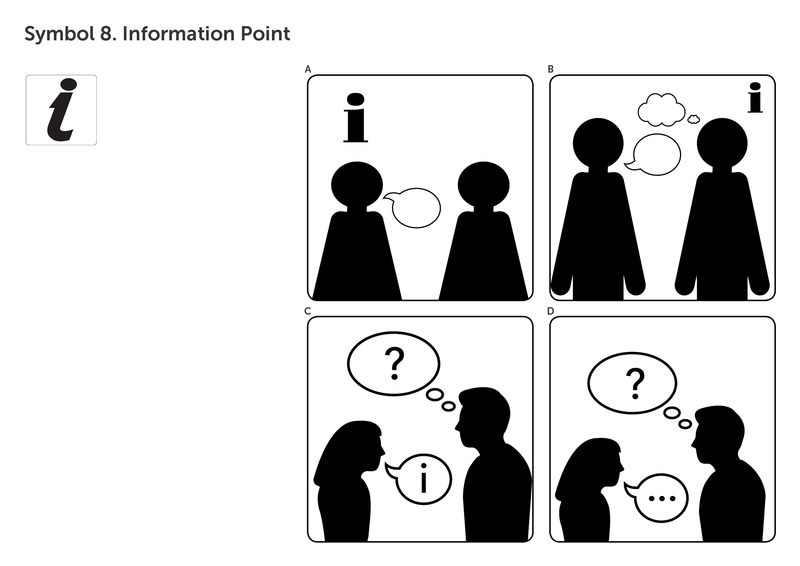 Facilitated by Steve Milton, Director of Innovations in Dementia, these sheets were used to evaluate the legibility and understanding of each of the concepts with groups of people living with dementia across a number of locations. The sessions were recorded and subsequently transcribed. The symbol concepts were tested with 39 people of varying ages and stages of dementia. 33 of these were across five groups and there were six 1-2-1 interviews. Groups were consulted in Shrewsbury, Liverpool, Glasgow, Canterbury and Salisbury. Five interviews took place face-to-face in Stockwell and one via teleconferencing in Salford. There was an overall enthusiasm from participants to feedback their views on something ‘practical’ rather than policy based that will impact positively on people’s everyday life. 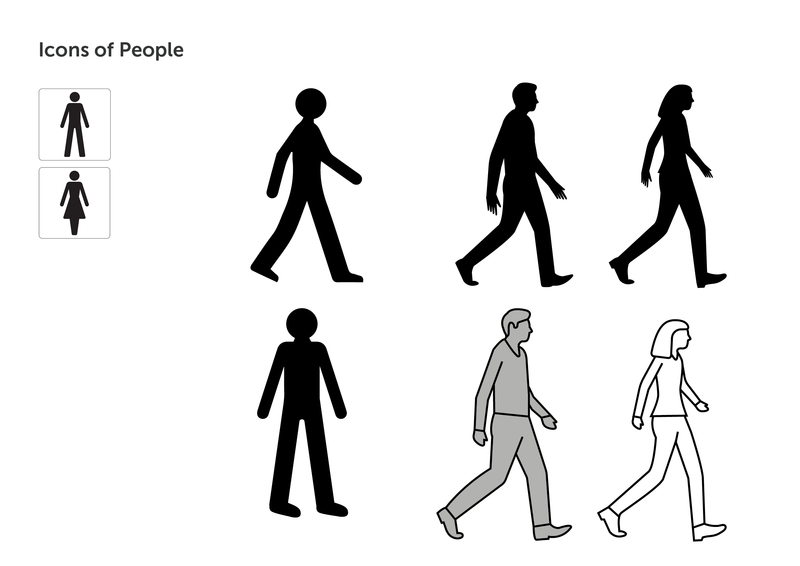 ‘Morph’ figure (on the left) was generally preferred as people found it clearer/simpler. Everyone recognised this as a toilet. Symbol ‘B’ in perspective with shaded flooring was unanimously preferred and the white figure on black background was least preferred. of escalator handrail to differentiate it from stairs. The rounded shape also implies movement which is helpful. 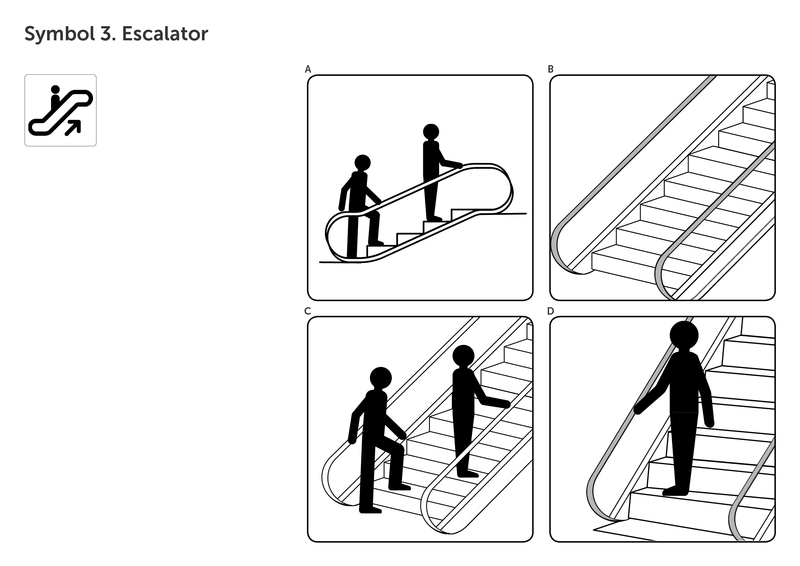 The two people interacting with the escalator in ‘A’ and ‘C’ was well liked. Maybe we could develop ‘A’ in 3D with perspective. Many liked the idea of adding an arrow going up, or down for a different version of the symbol, to emphasise the indication of movement. 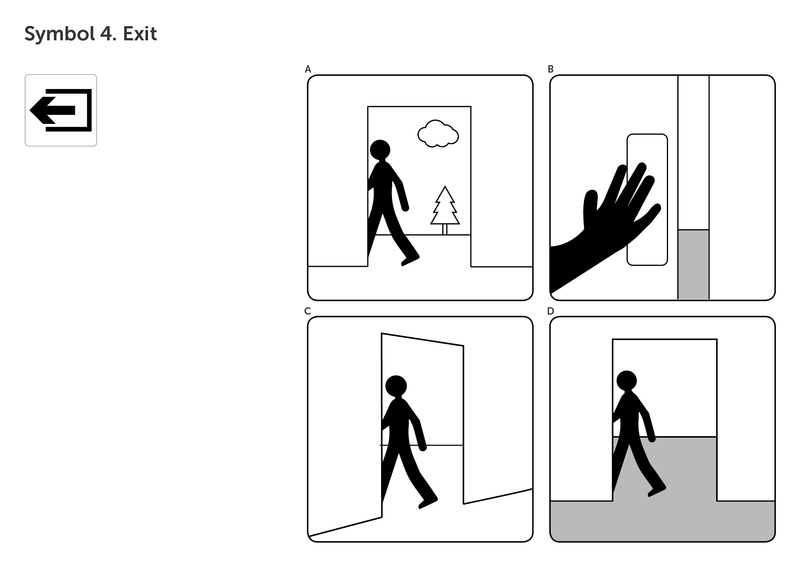 There was a clear preference for ‘C’ showing perspective noting that the person should be clearly stepping from one space to another, rather than walking past the door. The tree and cloud were identified as representing the ‘outside’ and this was liked, as if moving from one environment to another. The floor shading could be understood better if lower down, so less like the person is in water. 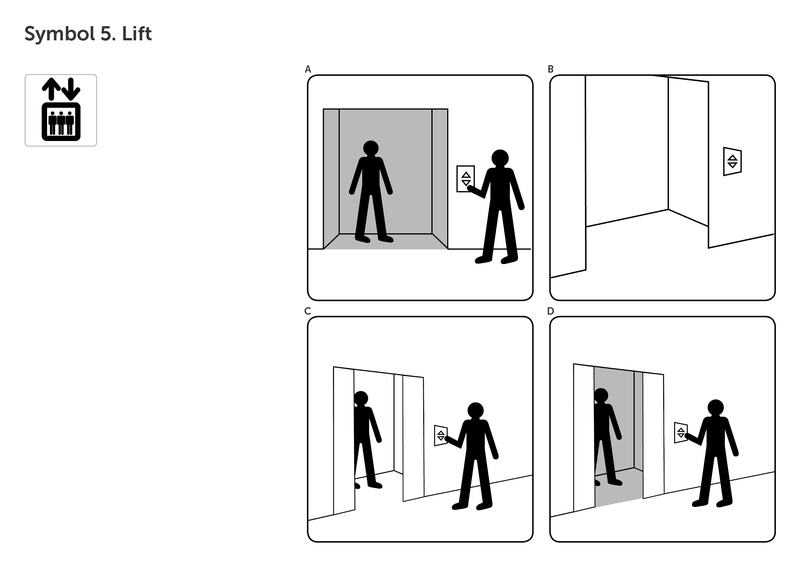 There was a clear preference for ‘D’ showing perspective, doors and shading within lift. There was absolute consensus that the people interacting are important to the understanding of this symbol. There were comments about the button increasing in size! 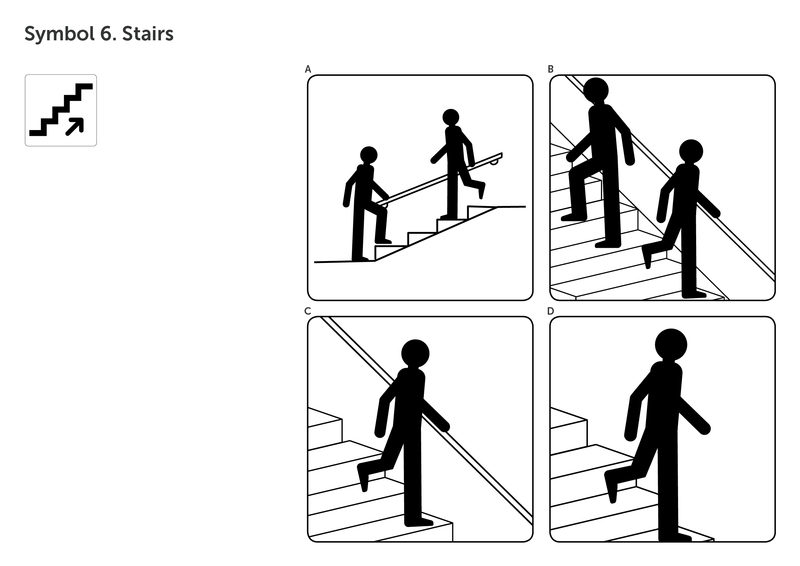 Everyone recognized the options as stairs. Although ‘B’ got the highest number of votes, there was a preference for whole shape of the staircase as shown in ‘A’. Everyone agreed that the handrail helped them feel reassured. 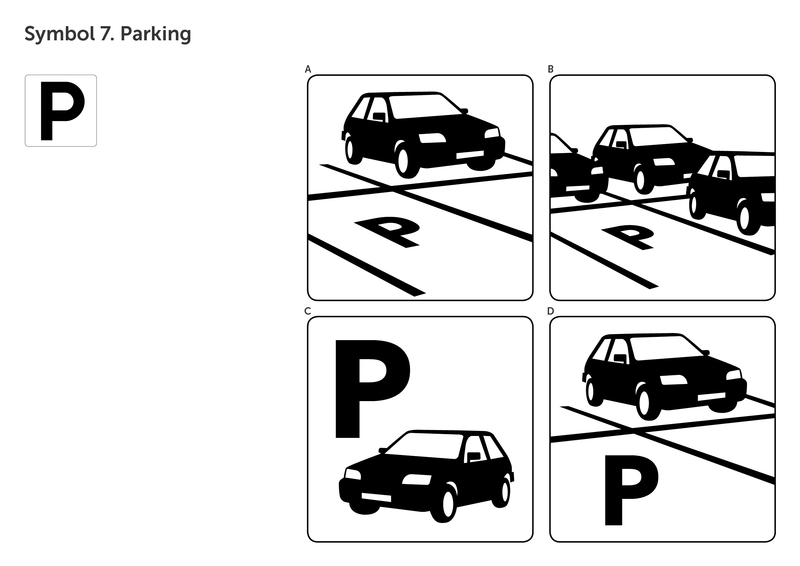 Almost everyone recognised this as parking and there was a unanimous preference for the simplicity of ‘C’. Some of the options i.e. ‘B’ showed too much information and detail which was confusing for people. None of the options shown were popular. Concensus was for the original ‘i’ symbol to be retained. 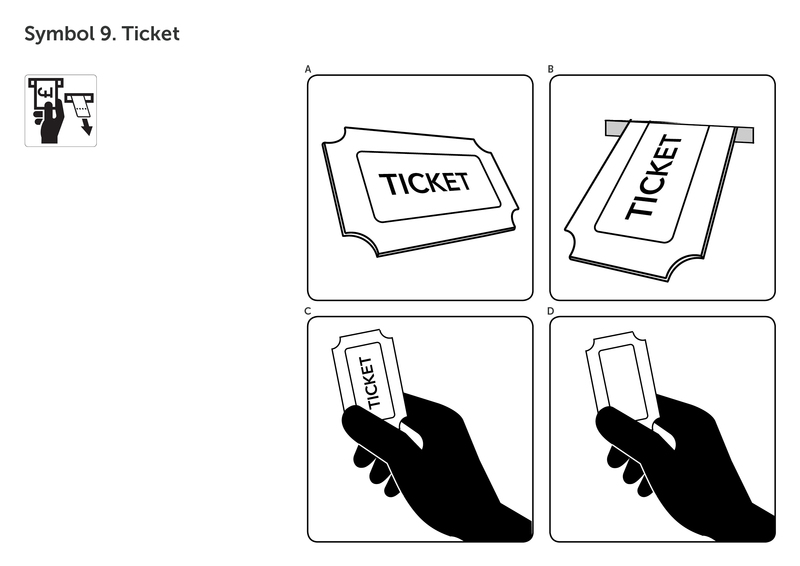 Much discussion was had about whether the symbols represent buying or or showing the ticket. In the end ‘A’ was agreed the most popular. need it. It was pointed out that, for example on buses, there is a space reserved for wheelchair users so we don’t need to include the wheelchair access symbol. We need careful development of the wording to support understanding of this symbol. Symbol ‘C’ was the clear preference because of its simplicity and perspective. The doorway through to another room wasn’t necessary. Everyone found the seated people helpful to the meaning, though they should look less rigid and more active. The clock (with no time shown) could be included as it was popular with most participants. The perspective of symbol ‘C’ was preferred, with the fire from symbols ‘A/B’. 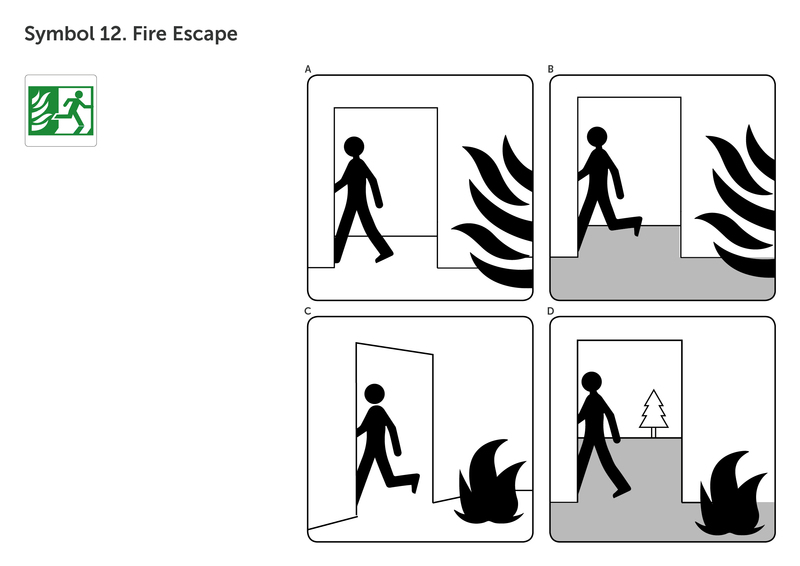 It would make sense to include the outside elements from the previous Exit symbol, as well as movement of the person from one space to another. Everyone correctly identified this and ‘A’ gained the majority of votes. Some pointed out that the person was controlling their own chair rather than being pushed as in the existing symbol. Some felt an attachment to the existing symbol and questioned whether we need to update the design of the symbol at all. Most weren’t able to identify any of the options shown but for those who recognised some sort of need, symbol ‘D’ was preferred. Adding colour (red) to the cross at the next design phase may be helpful to the understanding around ‘health’. Careful consideration of the words that support this symbol is needed to aid understanding. Our next step is to look at the user testing feedback in detail to develop and refine the design of each symbol. We’ll consider the impact for the user of language and colour – which words that accompany symbols are most easily understood i.e. 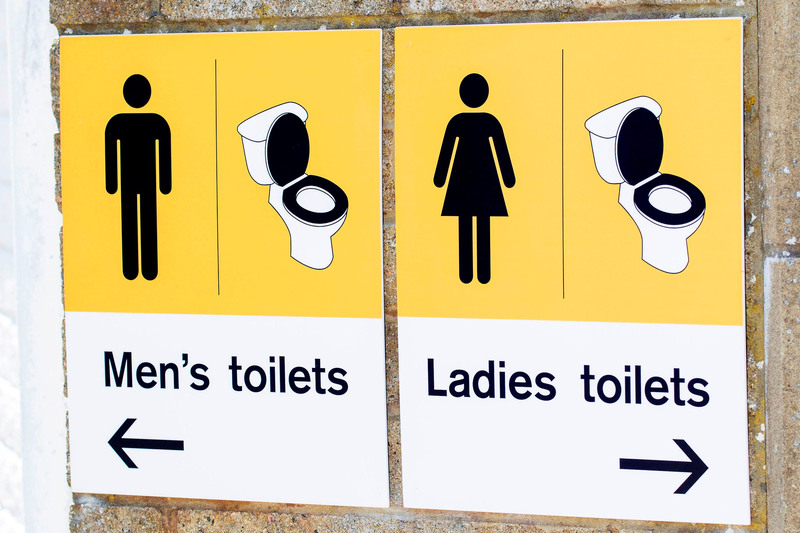 toilet / restroom / ladies / WC / public convenience. 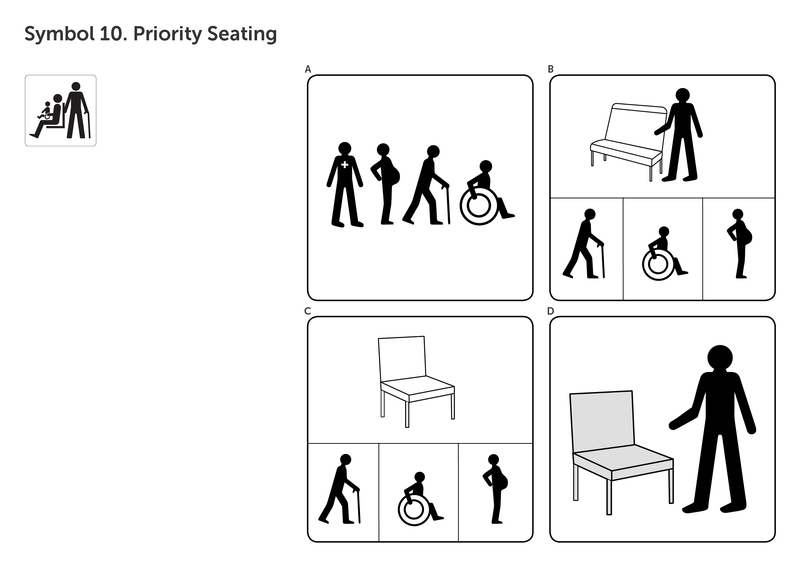 The trickiest words to consider and resolve will be ‘Priority Seating’ and ‘Hidden Disability’ and we will be working with language strategist Ben Afia https://www.benafia.com to develop some options for testing at the next phase. We will also consider colour i.e. does a green exit symbol or a blue parking symbol effect its communication? The design development will lead into the next phase of testing with new groups of people in July. As designers we’re ambitious to tackle society’s big challenges – that’s what gets us out of bed in the morning. 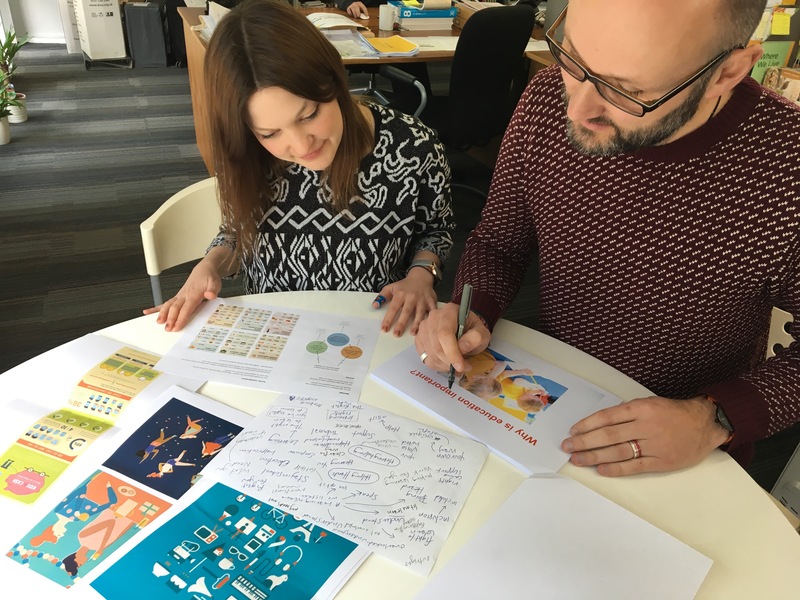 So when we were asked to design an accessible website aimed at 12-15 year old children with additional support needs, we jumped at the chance to work on a project that will really make a difference. Living with additional support needs means that school can be a real struggle for children without the proper support. These children and their parents or carers may be feeling worried, frustrated or confused about getting the right education to suit their needs. They’re looking for help, and there’s a chance that they have felt let down before and have come to the Additional Support Needs Tribunal as a last resort. Our aim was to develop a communication channel that would instill a sense of empowerment for its audience and feel like a helping hand. Something that is welcoming, informally informative, and is easily understood. And something that helps in getting all children the education they are entitled to. 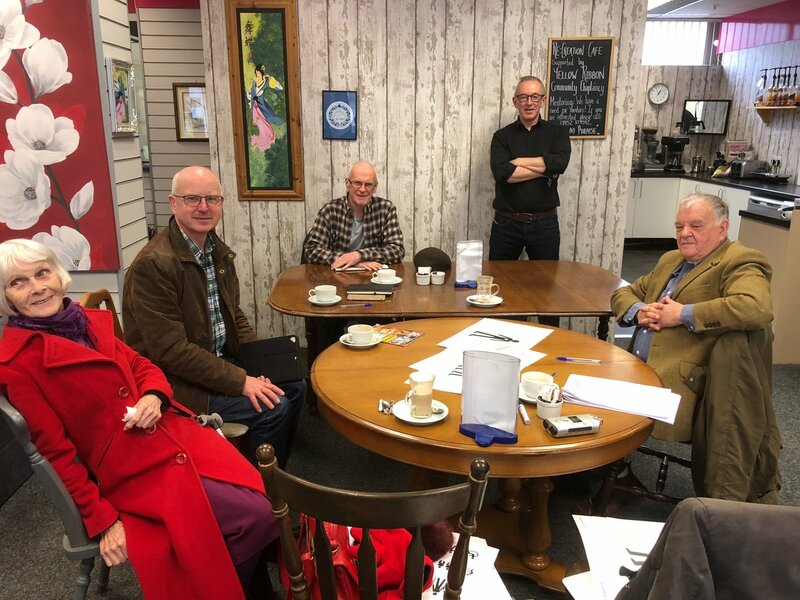 We started off by considering a new, original name for the service to replace Additional Support Needs as part of the Health and Education Chamber of the First-tier Tribunal for Scotland – which we didn’t feel was accessible! So, we developed the name needs to learn to capture both ASN [needs] and education [to learn]. The name works well when we talk about putting children at the heart of the judiciary service: All children in Scotland should benefit from a school education. When this isn’t happening we look at each child’s individual circumstances and their unique needs to learn. We look at Jamie’s unique and individual needs to learn to make sure that he benefits from school education. 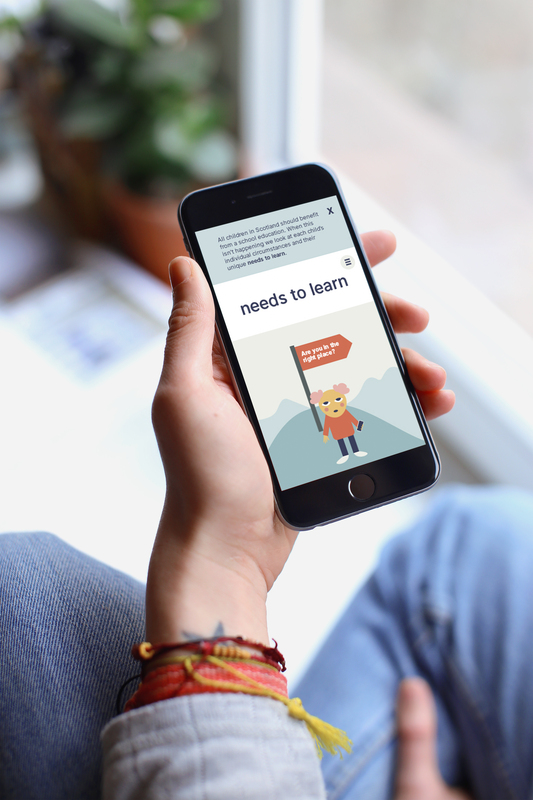 To build on the power of needs to learn, we developed a new visual language to help with signposting the user to navigate through the information provided. 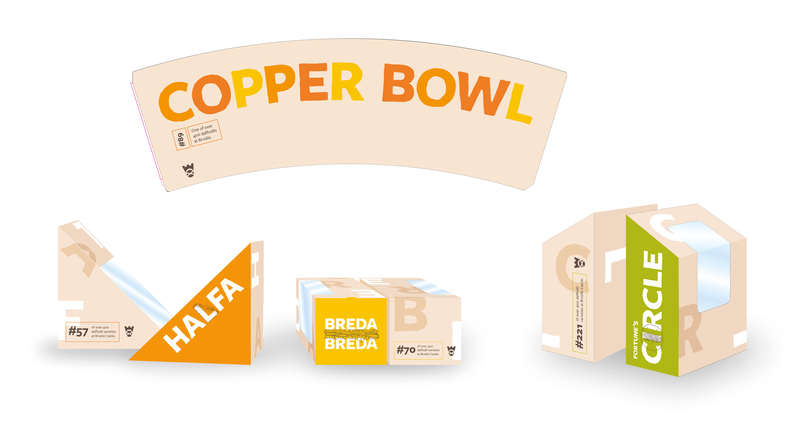 We created a carefully considered colour palette, soft shapes, an engaging illustration style that would appeal to the age group, accessible language and a font that was highly legible on screen. The content was edited down to short blocks of text and bullets points so that information could be easily read and digested by the viewer. There’s also a section on the site titled ‘word meanings’ to explain the meanings of tricky words, especially legal terms that are hard for all of us to make sense of. If you’re 12 to 15, have additional support needs and want to make a change to your school education, then yes you are. We created a prototype, using Invision, and conducted user testing with a group of 12-15 year olds with additional support needs. We observed their interaction with the site, including ease of use, and asked them what they generally thought of the site. Their feedback played an important role in the final development stages of the website. Since the site launched, feedback from users is very positive. All children are entitled to, and deserve an education, and if needs to learn helps their education needs to be met then we’re proud to have played a small part to achieve that. 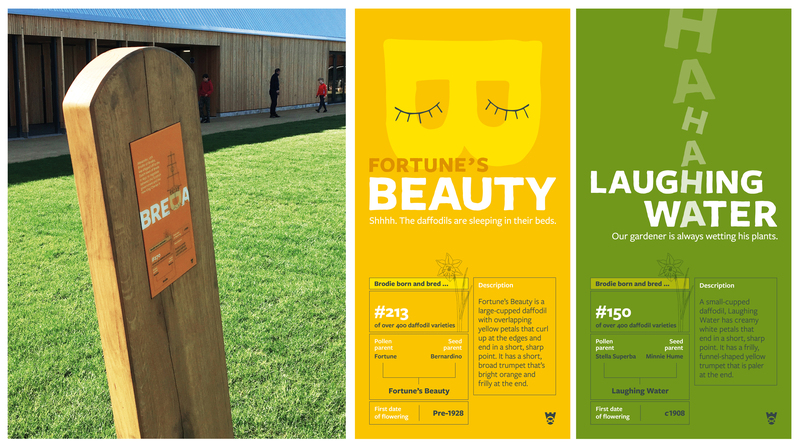 StudioLR provides graphic design services to a range of corporate and third-sector clients. We’re committed to providing these services without compromising security for our clients and stakeholders. From this website, we do not collect any unique information about you (such as your name, e-mail address etc), except when you specifically and knowingly provide such information via direct contact from this website (i.e. e-mailing or calling us). During the course of service enquiries and transactions, we will store your contact details in our database to allow for continued business communication with StudioLR. Your details are securely stored on our CRM system and email database, when we have a legitimate and relevant business reason to do so. By providing personal details during direct contact with us you are consenting to the use of those details for the purposes of identifying you as a unique user. This information will not be shared with any other entity or organisation, without your explicit consent, aside from our service providers who may operate elements of our service and process data on our behalf. As required by the General Data Protection Regulation (GDPR) we follow strict security procedures in relation to the storage and disclosure of information which you have given to us, to prevent unauthorised access or use of such data. Through our web provider and monitoring services, we automatically receive and record information on our server logs from your browser, including your IP address and the page you request. We may also record information about pages visited on our site, in order to improve the way our site operates. To send you updates about StudioLR and other information, which we believe, may be of interest to you. For example, updates about recent projects, news from the studio and opportunities to work together in the future. If you have opted-in to allow us to contact you for these purposes, we may do so by email, telephone or post. We have physical, electronic, and procedural safeguards to protect information about you. We will not retain your personal information longer than necessary. We will hold onto the information you provide either as long as needed to be able to provide our services to you, or for as long as the services we provide are relevant to you. If you have previously entered into a contractual agreement with us for any services we will hold a copy of the contractual details for a period of 6 years from the end date of the relationship. How can you change/remove your data? At your request we will supply a copy of the information we hold about you. If you would like to change any information we hold about you that has been collected via use of this Website or want to it to be removed from our database, you should contact us at raini@studiolr.com. You also have the right to unsubscribe from our database by selecting unsubscribe option at the bottom of any of our communications. By using this website, you consent to the collection and use of your personal information by StudioLR in the manner set out above. Our website may, from time to time, contain links to and from the websites of partners/affiliates. If you follow a link to any of these websites, please note that these websites have their own privacy policies and that we do not accept any responsibility or liability for these policies. Please check these policies before you submit any personal data to these websites. We will not rent, sell or share the data we hold about you with other people unless by explicit written or verbal consent and for service delivery purposes only. We may disclose information we have collected about you to third parties where required to do so by law. We comply with the Data Protection Act 1998. For the purposes of this Act, StudioLR is the data controller and sole owner of the personal data collected. We have physical, electronic, and procedural safeguards to protect information about you. However, the Internet is not a 100% secure medium of communication and, accordingly, we cannot guarantee the security of any information you send to us via the Internet. We are not responsible for any damages you, or others, may suffer as a result of the loss of confidentiality of such information.